The WE Boston Chapter of Women in ETFs launched in June of 2014, making it the first WE chapter for the organization. As of November 2018, WE Boston proudly has over 340 members, both men & women, spanning the ETF Ecosystem: ETF providers, ETF asset managers, ETF owners, media, index providers, broker-dealers, law firms, new ETF entrants, consultants, etc. Click on the links below to navigate to other areas of the WE Boston Chapter page. Join WE Boston as we learn new culinary techniques, deepen our recipe bench, and hone our cooking skills, all while working with some of the best local produce. Guided by Chef Cleo you’ll create an exciting three-course meal based on seasonal, local food, and increase your comfort in the kitchen. 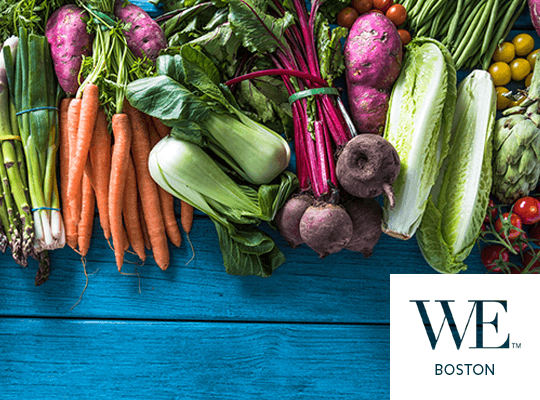 Come ready to roll up your sleeves and get cooking with your fellow WE Boston members! Join WE Boston for a Spring Social! Reconnect with other chapter members and learn about the exciting events we have planned for 2019! Bring a new chapter member and be entered for a chance to win fun prizes!